The problem is that very few people in DC are thinking of this as a structural challenge. Until they do, there is little basis for the sketch of a potential solution. What does this mean for President Obama and the Democrats? It means that they had better figure out what they need to do to fix the economy. If the economy is still in bad shape at the midterm elections, the Democrats will lose a bunch of seats. But if it’s still in bad shape in 2012, the consequences could be far more dramatic. The American political system has historically only seen big changes in times of great crisis. A still-depressed economy in 2012 would definitely qualify. If that happens, you’re likely to see extremists come to the fore in both parties, suggesting far more radical solutions to the country’s problems. A Barack Obama presiding over 10 percent unemployment in 2012 is a Barack Obama who will be primaried from the left. And with the Republican party already hurtling full speed towards the right, you could see a Ron Paul-type candidate who espouses truly wacky economics challenging seriously for the GOP nod. It’s important that liberals remember that FDR wasn’t elected in 1932 because he was liberal. 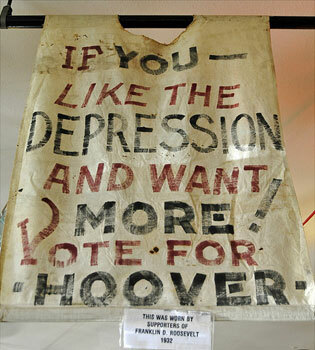 He was elected because the economy was a disaster and people wanted to throw the bums out (see photo above). If the economy is still in the dumps in 2012, no one will care about Obama’s or the Democrats’ excuses or the process obstacles that kept liberals from achieving their goals. Economic chaos causes unrest, and unrest is disastrous for incumbents. So liberals better hope that the administration understands the danger it’s in. McCain Hearts FDR. What’s the (New) Deal?